The corruption of the Shrine of Yoritomo! A little different from the snippet previously provided, but I like this one better. Featuring everyone's new favorite Daimyo, Goju Yurishi! Also the Kanpeki quote is interesting... considering that Fu-Leng is dead and Daigotsu sits in his place. I think he was lying to get the Oni to follow him. I was quite shocked to see Oni working directly for Spider in a story. And where was that shrine geographically? Yeah that's pretty weird. Typo maybe? Or are we to believe fu leng is being venerated as a kami despite his death? Raises a lot of questions. It's not a typo, but I understand it might be confusing. So Kanpeki views Yoritomo as an upstart mortal, while he thinks his father is basically superman and the heir to the greatest god of all. Makes corrupting the shrine a petty, but sweet vengeance. It could simply be a matter of their goals aligning. Daigotsu didn't say that the oni lords would never obey him, just that they might rebel. @max: what is the official spider clan belief with regards to fu leng and daigotsu? Is daigotsu equal to? Same divine status but different? I have a multitude of theological queries!!! I'm really happe that we are getting a Fiction Week that resolve outstanding story prizes. Thanks, Story Team! I can also now see how it is possible to save techniques from corruption and destruction. Nicely done. I'm not sure how much the choices will have to do with Onyx Edition, though, because we haven't yet read about the opened seals and the coming darkness. That's why the desecration of the Shrine of Yoritomo came out of nowhere somehow. What is Kanpeki's motivation (or Yurishi's Motivation in case he lies about Kanpeki's involvement; he is the child of a solidified lie, after all) to defile the shrine and gift it to Jigoku? But it's great that an Irish win involves Justin Walsh's character Yurishi. Without Justin the L5R community wouldn't be what it is for many of us. But I don't quite understand how the capture of one Scorpion character ensures that the clan won't be able to use the Traitors' Grove throughout Onyx Edition. Of course, this particular plot is not yet finished. I certainly liked that oni and sea trolls are involved and that they obeyed the commands of a human character. It's not as cool as when Isawa Fosuta summoned Sentai no Oni (who was a often played card back then, not only by Shadowlands Horde or Spider), had him save Pale Oak Castle (White Oak Castle) from the Yobanjin to raze it himself, because he was raised there. But we Spider Players should work on a second kotei victory and the Story Team needs the possibility to up the ante for this case. It's also great that the ST incorporated that the desecration was the result of Jack Murray accepting a Scorpion bounty. I want to see more of these subtle homages to the OOC world around the gaming tables. Also, Keep the OOC references below the fictions, they help to see the resolution of prizes even if they aren't overly obvious. The part with the Battle Maidens I would have thought is about saving the steeds, not the samurai-ko or their technique. But it's definitely better than some of the Samurai Edition prize resolutions: "He opens a treasure chest and finds Prize 1, Prize 2, Prize 3, Prize 4". Keep the fictions coming, they've been enjoyable so far. They could use more conflicts for my tastes, though. But tastes do vary. My take is kinda similar to what the Moshi did after Amaterasu died. Daigotsu is the guy in charge, and the one who receives most prayers. Fu Leng is more like a highly honored ancestor, and receives some prayers, but not as much. Thanks Audax! A lot of work went into these, so I'm glad you appreciate them. Also, I had never realized Justin was a fellow paddy, or that Yurishi was his character. I just love Yurishi and writing for him myself happy coincidences. Justin is the one who got the Air Dragon corrupted and transformed into the Shadow Dragon because of how he won Gen Con 2000 (?). He later won a Winner's Choice with Spider and picked Dragon Child. The base version of Yurishi has his name on the border. It might all be coincidence, but it still fits nicely. It is I seriously just put Yurishi in there because he's cool, and Kanpeki would have needed someone both mighty AND stealthy to get the job done. Glad it all worked out. I agree, these stories with quick resolution are nice. They may not have the opportunity to be a detailed as other stories, but seeing the results of wins so quickly really keeps folks engaged I think. By the way, do we know where the Shrine to Yoritomo is actually located? It's in the Empire as far as I know, but it on a secluded island or near an important Mantis stronghold? In other Fiction Week stories there are some references to Winter Court 4, including homebrew characters. I hope that we will see similar references for the Spider. With the Mantis getting access to the Hantei Sword and saving Shourido, we might even see our Mantis treaties, the handing over of Eastern hub village or the dark temple in Broken Wave City. In any case, win more tournaments, fellow Spider, or lobby for others to choose our icons. 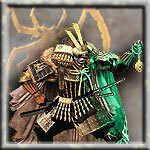 Or, play Mantis/Phoenix/Scorpion and win a Kotei yourself to choose Spider icons! I have to say I loved it. Short and sweet. Very much like some of the older RPG setup of challenge and strikes for story plot obstacles. Leaving alot of the tiny details to our imagination while the meat is right there to chew on. Bravo!